My wife (The Good Democrat) wanted to know my opinion of the Palin for VP pick. I told her that at first, I viewed this as a desperate gambit by McCain, but the more I looked into her, the more I think that she would be a great VP. My wife told me that on MSNBC (We have sold our souls to get "The One" elected) that they were calling it an early Christmas present. Now, if you honestly believe that your opponent has made a serious mistake, why trumpet it? Isn't it better to remain silent, smile appropriately, and let your opponent self destruct? But the Left side of the debate is over the top in their disparaging remarks. Wulfgar left some snarky comments below, which caused me to look at his site, where he is really over the top in what can only be described as a juvenile tirade. The Leftosphere is running amok trying to disparage and discredit a woman who is a governor of a state, and who maintains an 80% approval rating. The whole of their argument seems to be that Ms. Palin is not qualified to serve as a VP. This is the same group that thought that Gov. Tim Kaine was being promoted as a possible VP choice for Obama, and he has exactly the same amount of experience as Gov. Palin. Oh, I forgot, Kaine is a man, so therefore, he must be more qualified than Palin, or so seems to be their argument. The Left's desperate attacks belie that they know that they have reason to be concerned by her pick. During "The One's" speech last night, He said that if you don't have a record to run on, you attack your opponent. I guess the implication for the Kool-Aid drinkers like my wife (The Good Democrat)is that McCain has no record. Except it isn't that hard to notice that Obama is the one without a record and he is attacking McCain. Now, we find out that Palin is being attacked because she has no experience. I would say "Pot, meet Kettle" except that Palin has two years of governing. That's two more years than "The One." I may not be able to spot sexism as easily as some, but this is just over the top. To suggest that Palin would have to choose between her duties as Vice President or taking care of her child with Downs syndrome is appalling even to me. Further proof of the irresponsible nature of so called "journalism" in their desire to secure the Presidency for "The One." I am sure that if Palin was a Democrat, the story would have been how deftly she balanced her dual roles, and how she would be a model for all working women. I would say that this destroys the MSM credibility, but that is like dividing by zero. Mental illness is a bigger problem than people who don’t work with the mentally ill are willing to admit. Part of the problem is the lack of awareness to how much of a problem we are facing. For most of us, the mentally ill are those people wandering around downtown with multiple layers of clothing and muttering to themselves. But the mentally ill include high school honor roll students who are cheerleaders and commit suicide. More people die from suicides than from car crashes, but we always see Public Service Announcements on TV that tell us not to drink and drive, or to drive carefully. How many public services ads do you see about mental illness? In Montana, we suffer from a shortage of available mental health caregivers. Professionals who are trained to diagnose, treat and care for the mentally ill deserve our greatest appreciation. But we don’t have enough. Right now, if someone is suffering from severe depression in Missoula, they will either have to wait for up to four months to get an appointment to see a psychiatrist, or the county attorney will have to get a court to order that they be involuntarily committed to Warm Springs, which is also understaffed and overcrowded. What we need are regional crisis beds that can be used to provide protection and care for someone who is a potential risk to themselves or others for up to ten days. Believe it or not, there is actually a cost savings in having these kind of facilities, because many county budgets are being depleted by transporting the mentally ill to Warm Springs for incarceration up to 90 days. Plus, keeping the patient in the vicinity of family and friends can be enormously beneficial to long term treatment in the community. We also need to examine if there should be more people who can provide care. Specifically, I am thinking that PhD. psychologists should be trained and given the authority to prescribe drugs to help the psychotic, the schizophrenic and the manic-depressives that exist in our community. We should also look at trying to recruit psychiatric nurses who could function under the supervision of an M.D. and provide care to those who need it. While this cause is important to me, I have delayed posting on it waiting for the Supreme Court to rule on an appeal that I filed that involved a hopelessly psychotic individual who thought he was being attacked by the devil in the form of an 86 year old woman. After his arrest, he was sent to Warm Springs, where he was medicated to the point that he could stand trial. In Montana, we do not have an insanity defense. If it is your conscious object to swing your fist, even though you may honestly believe that you are swinging at the devil, you are guilty of the crime. As a result, the client, who also became my friend was sentenced to be in custody for 40 years. He first went to Warm Springs, where they verified that he was still doing well while under medication, and they transferred him to the Montana State Prison to serve out the remainder of his sentence. At least he won’t be alone. Some estimates put the number of inmates in Deer Lodge on psychotropic medicine to be near half. I would like to propose a change to the law that would allow someone who if found Guilty but Mentally Ill to be given another hearing before the sentencing judge when the maximum medical benefit has been reached to review the appropriate sentence. It may be that keeping the defendant under supervised probation that requires he maintain his drug treatments is more effective for the defendant and the community than simply replacing lunatic asylums with prisons. I do not believe that human beings are sacred, that we have souls, that we serve any purpose or that there is an afterlife or a place to live it. I think that we have no notion of what eternity is, what it would mean to live that lengthlessly long, or even why such an endurance would be thought a good. We are formed, as all life is, to reproduce ourselves. If there is a purpose within that purpose, that is the purpose. For us, the urge to do so runs from never to ever. Any disciplining of the urge is arbitrary, but not therefore wrong. It becomes wrong when a discipline turns an artificiality into a reality in order to subordinate one half of a species to the willful ignorance of the other half. For to say that a spermed ovum is a person is to say that the R at the beginning of my letter is the letter. While I am not one to get into any kind of theological discussion, especially with such a firm believer in atheism, I do wonder if Mr. Fleming has ever had to face the kind of situation that the survey above was reporting? My first wife was diagnosed with colon cancer in 1987 while I was finishing up a tour in Germany at the time. She had gone to Virginia to await my return, and she was studying to become a special education teacher at the time. She fought the battle bravely, but in the end, due to the progression of the disease, and the lack of similar progress in a cure, her body was self destructing. I remember sitting with her every hour after work until they kicked me out every night. We would talk, but we both knew that there was no talk of the future. Even so, I prayed as hard as I could for a miracle. I read everything that I could on colon cancer, and no doubt annoyed the bejeebers out of the doctors and nurses at St. Patrick's with questions. Grasping for any tidbit of hope that might come my way. The last three days of her life, she was in a coma. At the end, having not spoken for some time, she suddenly started talking to her brother. Her brother killed himself before I met her. Now, I know that it could have been just the remnants of a brain shutting down, but it was startling nonetheless. After 10 weeks in the hospital, the end came at 4:12 p.m. on the 16th of February, 1989. Even as the beeping machinery that monitored her earthly shell started the long continuous high pitch, I still was reaching for the nurses alert button, hoping that it was just something wrong with the monitors, even while knowing at the same time, that they were functioning properly. During that entire period, I prayed almost continuously for a miracle that never happened. Some might have turned in anger against God for betraying their faith in that way. I may have made the mistake of slipping in another direction. I believe in God, I believe in a hereafter, I believe that good and moral and decent people will go there, and I believe that my wife is there. But I also believe that God doesn't intervene. Having set the universe in motion, God simply observes. I know that is heresy to some. My brother, whom I love like a brother, is more fundamentalist, and believes that I just wasn't doing something right. Maybe I wasn't, but that doesn't mean that I wasn't trying. I pity Mr. Fleming for his view. In some ways, they are similar, in that I too don't believe that there is a rope that will be thrown to us by God. But, we differ in he sees nothing, and I still believe that for all the troubles and travails of life, there is something better, and when we get there, we will wonder why we waited so long. From the Hubbel Deep field exposure. The galaxies are at the outside of what we are able to measure. 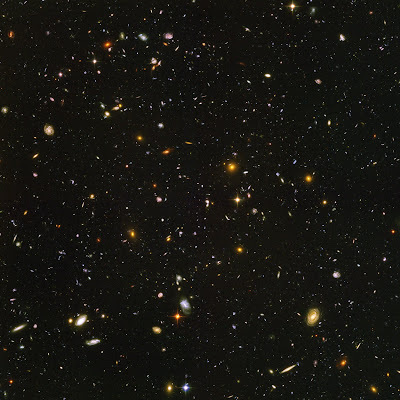 Each galaxy having millions or even billions of stars. Could start to make you feel insignificant. But if you don't, just read this and remember, that it's only introductory. Caution, some may be offended by the language, but it is still pretty funny. The Surge Worked! Now What? Only the most die hard Bush Haters are unable to admit that the conditions in Iraq have improved. Democratic talking points seem to be that the addition of troops was inconsequential to the improvement, that it would have happened anyway. While this is just posturing for a political audience, serious students of war recognize that this is a very complex issue with multiple moving parts. Sort of like the wag's definition of a helicopter - "a loose collection of parts flying in close formation," the application of many different types of power, political, military and economic, have fused into a solution that does seem to be working. While it is a truism, that there is no pure "military solution" to a problem, this truism operates in a vacuum since military force is just politics by other means. If they are separated, it is just mindless violence. While I have always been opposed to the calls for a withdrawal from Iraq on an arbitrary timeline, in order to "force the Iraqis to act responsibly" the fact is that the Iraqi government is now calling for a withdrawal by 2010. So, why is it a good thing for the Iraqis to call for a withdrawal and not such a good thing for US political candidates to do the same thing? First off, it has always been the US position that Iraq is a sovereign nation, but it is also a fragile one since the destruction of most of the institutions that existed prior to April 2003. There have been many mistakes made along the way, but we are starting to get all of our acts together and there has been tremendous progress. Sure, the Anbar Awakening started prior to the surge, but it could not have been maintained without the additional troops, nor the change in policies that resulted in moving from "Force Protection" to a force presence stance that put troops into the neighborhoods. If you don't get the chance to travel outside of the US very much, you don't really learn to appreciate how much the rest of the world loves Americans, even if they don't like our policies, or the fact that we are a superpower. By putting troops on the streets, every soldier from the lowest private to the highest ranking general becomes an ambassador for America. The interaction and friendships that are created just by walking around are too invaluable to quantify. Another tremendous factor in the change in conditions, has been the improvement of the Iraqi troops. Until 2007, the Iraqi Army was not much different from other Arab armies of the region. They had little discipline, and poor training. Preferring to rely on personal valor as a way to overcome training and tactical deficiencies. When they came under fire, they tended to rely on the "death blossom" of shooting everywhere, without any controlled, aimed or directed fire. The result was just as likely to be fratricide as anything else. But through the training efforts of the American forces, they are becoming more professional and competent. Which can be both a good thing and a bad thing. The good, is that they are more likely to exercise the proper means of controlled violence to conduct their operations and achieve maximum efficiency. Talking to the soldiers that I know that have returned from there, there has been tremendous progress in their competency. The Iraqi Army has moved from being a toddler who American politicians wanted to run in the Olympics, to the four year old child that declares "I can do it myself." This is not to say that they are fully prepared to operated separate from US support, particularly in logistics and air support, but they are getting better all the time. The bad thing about this improvement in competence, is that they are rapidly becoming the strongest institution in Iraq. They are more trusted than the police or the government. If they have been trained in our values, that the soldier serves the people, not the Prime Minister, they will be fine. But Iraq has a long history of military coups whenever a government appears to be feckless or incompetent, just as they seem to be now. I was rather disappointed to learn that the Iraqi government went on vacation without finishing the business of holding a new vote in October. Hmm, I wonder where they could have learned that? While it was dramatic for the Iraqis to vote even under threats of intimidation from Al Qaeda, the government that they have elected is hopelessly out of date, in that it simply reflected sectarian voting blocks. A new vote could dispel the need for the sectarianism, which has dominated Iraqi politics of late. If there is a new vote, the Iraqis will be stronger if they reject sectarianism, as they seem to be wont to do. If there is no vote, I would be worried that the Iraqi Army may take matters into their own hands, and overthrow the government. Keeping at least one heavy brigade, one artillery brigade and an aviation brigade in Iraq would have a cooling effect on any such desire for another regime change. We have invested a lot in Iraq in terms of blood and treasure. The pay off is going to be the most successful country politically, economically and militarily in the region. Other countries will look at Iraq and wonder if their model of ancestral based leadership is going to last. We have made great progress in the Middle East. Now if we can just keep it from going to hell to soon, it will result in the most dynamic change there since Winston Churchill first drew lines on a map to create most of these countries. Denis Keohane at the American Thinker, is positing that Hillary could still secure the nomination. I had said something like that before, although not to the depth of analysis that Mr. Keohane has given. There certainly are subtle signs out there that Hillary is not exactly 100% behind Barak in his undertaking. And if even only some of the issues presented in the American Thinker piece are true, there could be some real fireworks in Denver in a few weeks. I don't really believe that it will happen though, since it could absolutely destroy the Democratic Party if it is perceived that Hillary stole the nomination. But, if the Super Delegates sit on their hands through the first ballot, all bets will be off, since Obama has just signed on to give Florida and Michigan full representation at the convention. That letter also gave the majority of Democratic primary votes to Hillary at the same time. A startling concession. At that level, you have to believe that there are no accidents, unless an amateur is in play. Hillary is no amateur. I am not as sure about Obama. Remember how much fun it was for the Left to go after Bush because he was always on "vacation?" Of course, when the President goes on vacation, he brings along the White House Communications Office with him, and is never out of reach for anything that happens. But when Congress goes on vacation, they are wandering around loose and unsupervised. Only the President can call them back into session, and if they are of such a mind, they can avoid that as well. And Speaker Nan, is of just such a mind. Sure gas prices are high. Sure, they are affecting personal pocket books, raising inflation, slowing down the economy. But that is not a good reason to end the more than five weeks that they had already scheduled off is it? Of course, the Senate is still in session. It wouldn't take that long to bring a bill to the floor, pass it and send it on to the President. While a do-nothing Congress is not necessarily a bad thing, in this case it is. The reason that Speaker Nan doesn't want to restart the session to take care of the people's business, is that members of her own Party are willing to include offshore drilling in a package of energy options. And Speaker Nan doesn't want any such thing. "I'll See You at the Debate B*tches"
It is almost as logical that Paris Hilton should parlay her celebrity status as anyone else to get to the White House. UPDATE: Hammond beat me to this, but it is still funnier than the current Presumptive President.